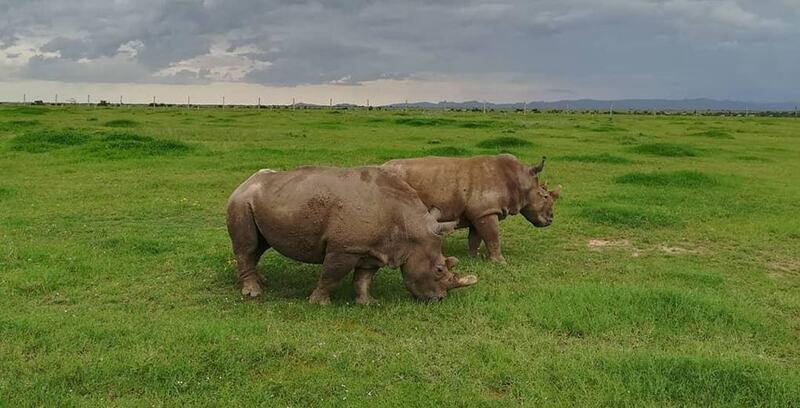 Ol Pejeta Conservancy, located in Northern Kenya is home to the largest black rhino sanctuary in East Africa, the last two remaining northern white rhino, a thriving wildlife community, thousands of domestic cattle, eco-tourism and many community projects. Ol Pejeta is tearing up the rule book of traditional conservation and combining conservation, community development, livestock farming and tourism all in one place. Conservation at Ol Pejeta really involves understanding the populations of animals here, having a stock or inventory of everything in the conservancy. But most importantly, we track population trends over time, this involves looking at predator and prey patterns and looking at population changes over time. Using these patterns, we can support all wildlife within the conservancy, as well as ensuring there is an integrated system with wildlife, livestock and local communities. My job is to ensure that we have diverse wildlife, ecological integrity is maintained, and we remain connected with ourselves and the rest of the Kenyan community landscape. It’s a very difficult job making sure every living thing in the conservancy is taken care of and continues to thrive. Right now (April 2018), the landscape of the conservancy is very green after very heavy rains. Six months ago, the picture was very different, we had severe droughts and many species populations declined rapidly. Population declines can happen due to drought, predation or competition with other species using the same habitats. Cattle also use the same grazing habitats as wildlife and compete for the same resources during times of drought. Getting the balance right, and managing thresholds, knowing when we need to step in to manage and help a species in decline is not easy! Rhinos are the principle species that we conserve at Ol Pejeta, in particular the black rhino. By conserving one species though, you are protecting the entire ecosystem. We aim to be continuous with the rest of Kenya and work with partners across the landscape, sharing experiences and challenges for the purpose of protecting what we have as a collective. We collaborate on matters of national interest, every rhino sanctuary in Kenya is part of an association that engage with the government on issues in conservation. Through this we push the message of conservation for rhino, and many other species. I’ve lost count of the years I’ve been at Ol Pejeta! I’ve been here for around twelve years, long enough to see population trends establish in the habitats here. Before joining Ol Pejeta, I did a bit of teaching and a bit of veterinary work, over the years I have developed a good understanding of Kenya and its wildlife and environment. I was born just 2 km from Ol Pejeta Conservancy, wildlife used to travel through my school playing fields and we would see them at playtime. Of course, my interest in wildlife and conservation started from there. I witnessed the open space disappear over the years and gradually the wildlife was pushed from their habitats, and I found myself interested in how we can protect them. I wanted to pass on the message of conservation to future generations. Lots of Kenyan schools are now starting to engage more in environmental conservation and collaboration. Conservation requires passion for what you believe in. if it is your passion to protect and conserve life that has no capacity to protect itself, you have the right spark for a career in conservation! The next step is to amplify that spark by giving it the right resources. Understanding the fundamentals of conservation and life, and protecting it not just for protection’s sake, but for prosperity are skills you gain through education. You must understand why we are conserving, what is important, including the genetics of populations. Through this, you begin to become not just emotional but knowledgeable. You understand that in the same spaces there are human livelihoods coexisting with conservation activities and other wildlife, we cannot blind ourselves to needs of human beings. So, for me, a conservation career is about true knowledge of the decisions that have to be made for both environmental and economic reasons. Activism has its part to play, but can sometimes miss the point, trying to prevent use of space, rather than providing options for co-existence. Having focus, understanding, knowledge and passion to make conservation work for both animals and humans is the key to a conservation career. If you would like to find out more about Ol Pejeta and their approach to conservation, visit their website at www.olpejeta.org or follow them on Facebook and Instagram.